Peak Design is a brand which makes luggage’s that keep your gear organized, accessible and protected when you are on the go. Loved by adventurers, wanderlusts, and commuters, they pride themselves on creating bags with emphasis on utility, creative and thoughtful design. Peak Design was first launched on Kickstarter after 10 months of careful designing and was an instant hit. Today they have 75+ products like bags, pouches, travel bags, bundles etc. 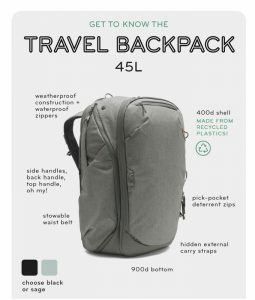 Buy NowTheir latest offering which has been launched on Kickstarter is the Travel Line which is a unique backpack with packing tools. They claim it to be one of their best products yet with unmatched versatility, access, aesthetics, and organization. Also grab 30% early bird discount on kickstarter. This backpack is made of weatherproof construction which can withstand any rugged terrain and weather. Some unique features of the bag include side handles, back handles, top handles, a stowable waist belt, hidden carry straps and a lot more. The design is ergonomic and comes in two colors – black and sage. The best part of this travel bag is the wide range of packing tools it offers for better efficiency and organization. 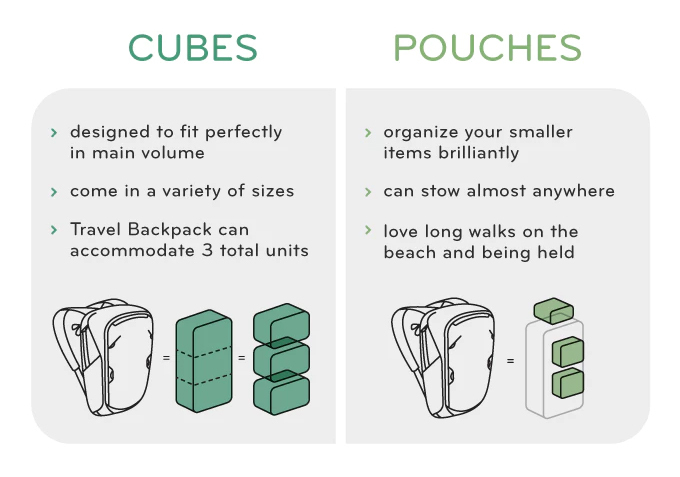 Their packing cubes and pouches can be used in all future peak design bags as well. The packing cubes are available in small and medium sizes and can expand and compress according to your requirements. These are available in 3 sizes – small, medium and large which provide protection and organization for your camera gear. 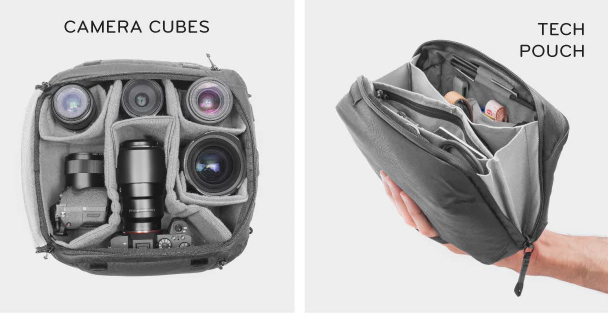 It can hold all your camera stuff and has an on-body side access. They contain movable pockets for storage of filters, batteries and SD card organization. Other pouches include the Tech pouch, wash pouch, shoe pouch and a rain fly. 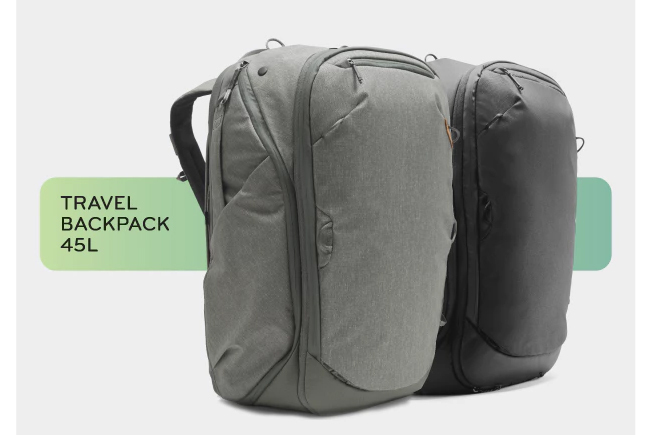 The Travel Line: Versatile Travel Backpack + Packing Tools – Pledge $235 or more with $300 MSRP. Why should you Choose Peak Design Travel Line? The latest backpack with packing tools lets you customize your setup to carry and access whatever you want. Peak Design has a world-class design, engineering, and customer satisfaction. All bags are made of weatherproof, nylon canvas which is 100% recycled. The flexible storage space, vast storage options, ease of access and tough construction come together in a package that is completely usable. In the US, shipping is free and outside the US it depends on the country being shipped to. It is free for the UK and starts as low as $4.95 for other countries. Handling time is only one business day for all orders. If you are unsatisfied with their product, you may return it within 30 days of purchase for a full refund. If you have a defective or broken product, you can return it and get a full refund. These Peak Design backpacks are best to carry around various stuff with flexible storage and a tough construction. The bag is sturdy, looks attractive and gives you a feel of a solid, versatile bag. It is preferred by all adventurers and travelers who are looking for a backpack which will protect their camera gear. Watch out for their all-new travel pack – and travel in style!